Venum are some of the most popular gloves on the market right now. You can find these gloves protecting the hands of some of the most elite MMA fighters in the cage today. Venum is one of the leading manufacturers and retailers of MMA clothing and equipment in the globe. Originally, Brazilian Jujitsu competitors who understood the needs of mixed martial arts athletes founded this company in 2006, and in a few short years it has become one of the leading suppliers of MMA gear. Venum is also an official sponsor of the Ultimate Fighting Championship (UFC). 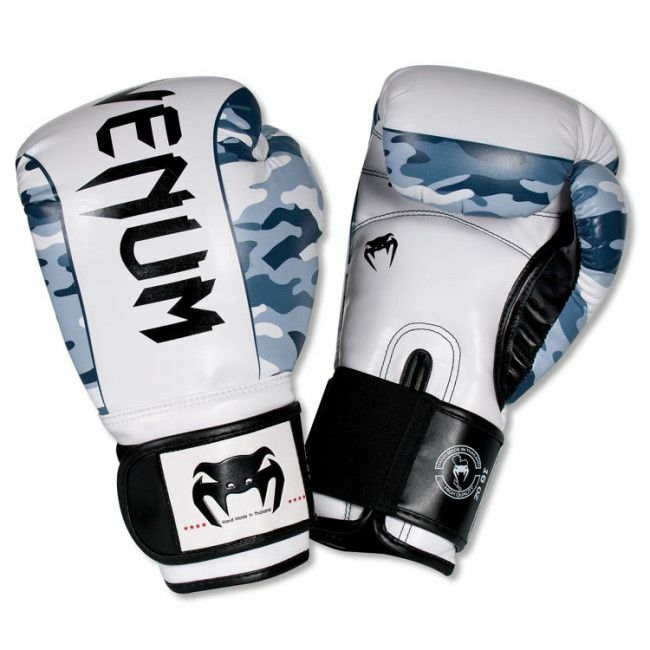 Venum Camo boxing gloves are some of the most distinct gloves that you will find on the market today. They feature a powerful design that is instantly recognizable by any fan of MMA. In fact, in a few short years, the “Brazilian Snake” logo has become a symbol for long-lasting and ultra-comfortable boxing gloves. The Venum Camo boxing gloves feature 100% Syntecl leather, a professional boxing-grade material. Boxing gloves are designed to protect your hand and provide support for your wrist—while reducing the likelihood of cuts during sparring. So, when it comes to protection, the material that your gloves are made of is absolutely critical. Venum gloves are designed with triple-density foam, which allows for 3 different layers of shock absorption. When you put these gloves on, it’s obvious that they provide superior protection—without feeling “puffy” or cumbersome. This padding allows you to take your boxing to the next level as you work the bags and spar with your workout partners. The high level of comfort is one of the ways that Venum gloves stand out from the competition. Venum produces some of the best-quality MMA products on the market, and these gloves are no exception. The stitching around the glove is tight and secure, and it’s clear that the leather is a higher quality than most gloves. Lesser gloves tend to wear out quickly, breaking down at stress points in the wrist, thumb and knuckles. The stitching or padding wears out too quickly and suddenly you have to buy a new pair of gloves! Not so, with Venum gloves. Venum gloves have been proven to go round after round in the ring, allowing you to throw thousands of hooks, uppercuts, jabs and crosses without worrying about your gloves breaking down. A little known fact: these gloves are the product of a dedicated research and development team in Thailand—home of some of the best kick-boxers on the planet. 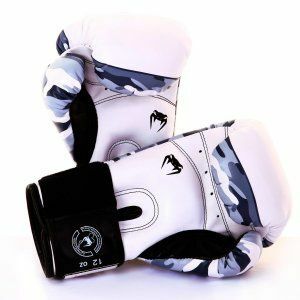 The Venum Camo boxing gloves reflect the same style that has made the company a world-famous brand. The gloves feature the “Brazilian Snake” logo on the wrist straps and on the palm, along with the company name in a sharp, angular font. If Dracula were an elite level MMA fighter, these would be his gloves. The edges of the glove and the tips of the fingers and 100% full attached thumb are covered in a blue-camo design, which is usually the last thing your sparring partner sees out of the corner of their eye before they eat a left or right hook. If you are sparring with the Venum Camo gloves, then you should choose the 16 oz option. This gives you and your training partner the maximum amount of protection. If you intend to train with these gloves on a heavy bag, then you should choose a weight that corresponds to your body size. Pros: There’s so much to like about these gloves. First, they feel excellent. When you slide them on, you can tell right away that they are superior-quality gloves. They aren’t bulky like some gloves and it’s clear that the designers put a tremendous amount of research into developing a product that is in a class all of it’s own. Also, I love the wrist support, which secures tightly with a large Velcro with elastic for extra comfort. When it comes to price/quality ratio, you simply can’t beat these gloves. Cons: These probably aren’t the gloves for you if you don’t like camo. At the end of the day, you want a glove that will protect your hands without sacrificing comfort and form. 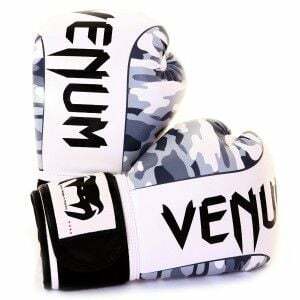 If you want a superior pair of boxing gloves for training or sparring, then you should consider the Venum Camo Boxing Gloves!